You probably don’t need a recipe to figure out how to combine these ingredients for breakfast…but here’s what we did – and we thought it was awesome. This “recipe” makes 2 breakfast bagels. FYI – It helps to have a toaster oven – we recently bought a toaster oven, not to be confused with a toaster, and are supremely happy about it. Toast both sides of the bagels in the toaster oven. Set aside. In a non-stick skillet, cook the bacon. Place the cooked bacon on a paper towel-lined plate. Drain about 1/2 of the bacon drippings from the pan (we usually treat the Pup and pour this on his food, but you can just discard it). In the remaining bacon drippings, fry 2 eggs. Break the bacon so it will fit on the bagels. 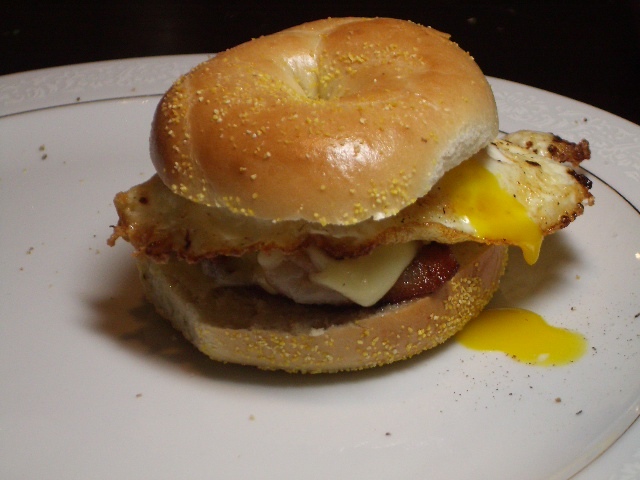 Place the bacon directly on 1/2 of each bagel, and cover with strips of the cheese. Re-toast the bagels this way, so that the cheese melts and “traps” the bacon strips – no one likes it when bacon falls out mid-bite. 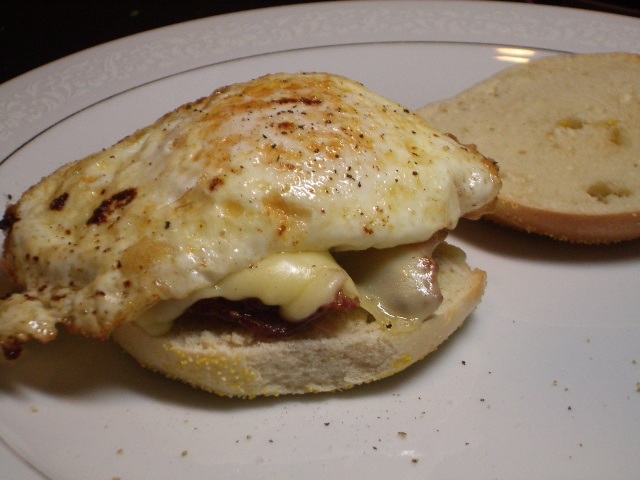 Place the fried eggs on top of the cheese, and top with the other 1/2 of each bagel. Gardner put mayonnaise and hot sauce on his bagel. I left mine alone…and found it to be absolutely perfect. Suit yourself. Can I come live with you? I had Cheerios and then a migraine. Yucky day.